Indoor / Outdoor. Safe for use on hard surfaces or grass. Color fast - will not stain clubs. Absorbs club shock (1.25" thick). Outstanding feel. 100% Knitted Nylon (not woven) & composite fibers. Dura-Pro Golf Mats will not delaminate! Resists tears, fading, curling and separation. Heavy industrial bonded for years of use (NOT Glued!). Dura-Pro Plus Nylon Tough Turf is 30% denser. Includes 2 Rubber Tees & 1 Adjustable Friction Tee Holder. 2 Tee Holes! 8 year ultra-violet protection for years of use. 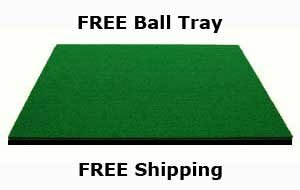 Remember to rotate your golf mat periodically to promote even wear over time! Warranty information will be included with your golf mat.